Sebastian C. Adams (1825 - 1898) was an American school teacher and surveyor active in Oregon and California in the mid to late 19th century. Adams was born in Sandusky, Ohio and lived for a time in Galesburg, Illinois before attending Knox College. In college he found that he had a gift for teaching and abandoned his academic career to become a private tutor and school teacher. Seeing a bright future in the American West, Adams traveled to California via the Oregon Trail. Though nearly perishing en route, Adams survived to take a land grant in Yamhill Country, Oregon. An ardent Christian, Adams founded a Christian college that, though it failed due to lack of funds, was ultimately incorporated into Bethel College. 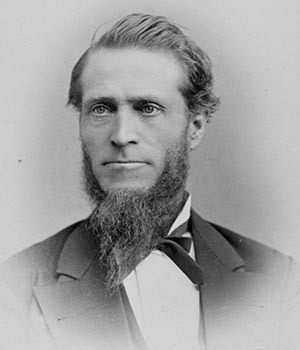 Later he worked as a surveyor, a preacher, a county clerk, and as Oregon State Senator. In 1871 he published his Illustrated Panorama of World History, a remarkable document that attempts to synchronize Biblical history with global historic elements. The chart was an incredible success and has proven his greatest legacy. Adams died in 1898 with the cause of death being cited as "la grippe".